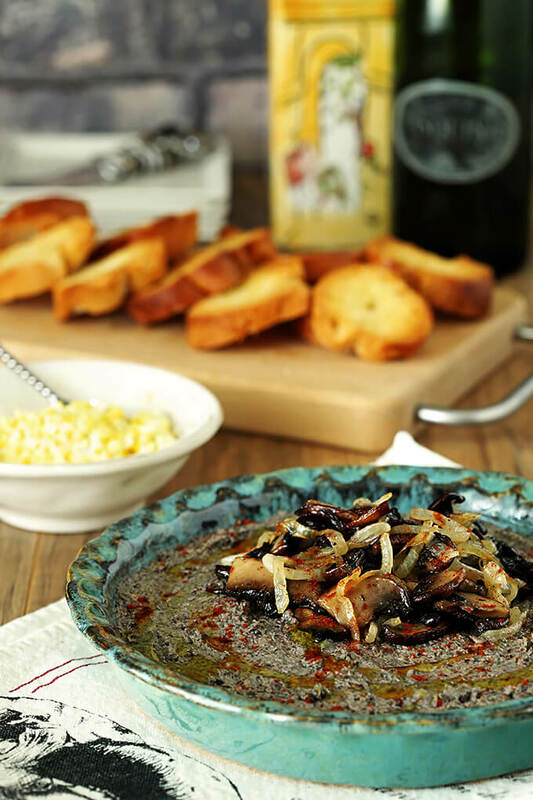 If you love mushrooms like I do; this might become your new favorite appetizer. 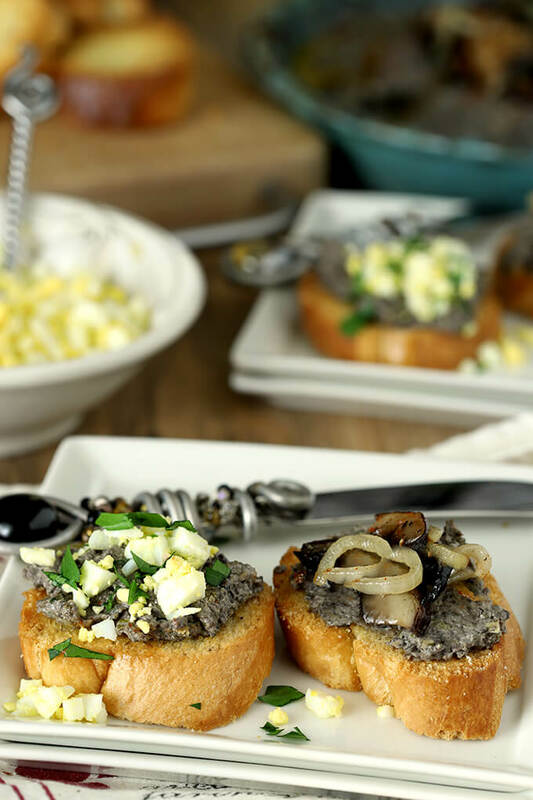 Mushrooms, toasted walnuts, thyme, and sherry are combined with cream cheese in this Mushroom and Walnut Pâté Appetizer for a smooth, delicious starter. I made this appetizer for Easter and it was devoured; you know when guests eat so much they feel a bit full and dinner hasn’t even started? So trust me it’s good even if it suffers from being an ugly duckling. There is literally nothing harder to photograph than brown food. In person it’s never a problem it seems but try to get a good photo and brown is brown is brown. I’ve tried to spruce it up a bit for photographic purposes but seriously those garnishes are not really necessary; the flavor is everything! Years ago I might include two recipes in a post as I did with this one that I featured with a Manhattan cocktail for the final season of the Mad Men series. When I do that I’ve found that one or the other will fade to the background and that’s what happened with this dish; one of my favorites too. I decided to break them into two separate posts and son of a gun…waylaid the recipe somewhere along the way. Oops. Not that I didn’t recall pretty much every component but still I did a search hoping to find an old form online on my VERY old site at Archive.org. No such luck but all these years later, an almost exact recipe was online at GenuisKitchen.com. I’m glad I searched; I also saw a recipe from MarthaStewart.com that included toasted walnuts…and mine now does too! I first tasted this Mushroom and Walnut Pâté Appetizer at an event with a local Chamber of Commerce I was active in. I had met a great group of other women business owners and we bonded; enjoying not just seeing each other at Chamber events but finding excuses to get together socially as well. A friend served this Mushroom and Walnut Pâté Appetizer at her home for a cocktail party and I was totally smitten. I sliced a baguette into rounds, brushed them with some olive oil and toasted them as the base for the pâté. True confession? You do not need to hard boil an egg (I had these Decorated Easter Eggs I had colored)) or make a mixture of mushrooms and sauteéd onions for garnish…unless you’re taking photos too. A little bit of parsley is nice though; just to add a touch of color. Don’t let this ugly duckling fool you; one bite and you’ll discover you’ve happened upon a swan! In a large heavy skillet over medium heat, add three tablespoons of butter to the olive oil and heat until melted. Add the mushrooms, green onions, and thyme, and cook, stirring occasionally, until liquid has been released and skillet becomes almost dry, 5 to 8 minutes. Stir in salt, pepper, and sherry and cook until skillet is almost dry, about 10 minutes more. Remove from heat, and let cool. Combine mushroom mixture with reserved walnuts, parsley, lemon juice, Tabasco, and cream cheese in a blender and pulse until the mixture is smooth. Spread mixture into a shallow plate or bowl and refrigerate for at least 4 hours or overnight. Just before serving, melt remaining 1 tablespoon of butter in a medium skillet and cook halved mushrooms just until tender, about 5 minutes. Season with salt and pepper. Remove the pate from the refrigerator and top with the sauteed mushrooms and chopped parsley. Offer chopped hard boiled egg as an alternative. Serve cool or at room temperature with toasted baquette slices, or any plain cracker. This looks wonderful! Brownness and all. 🙂 Neat combo of flavors. We can all use more appetizers, I’ll bet. Or I might just call this dinner — it looks that good. Thanks!